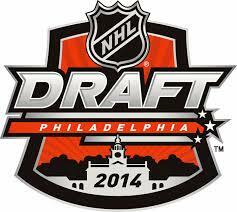 Each one of these players were drafted in the 2012 NHL Entry Draft. Also each one of these players has played NHL games. Which then brings us to another question. Which of those players are in their sophomore season having played their first year in 2012/13 ? The reason is, we often see a player enter their first year on fire and drop in their sophomore one. While Yakupov certainly rose to the top in his rookie season, his sophmore season has been a disappointment. Alot different on his PPG pace then Ryan Nugent-Hopkins who also struggled in his sophmore season. I can list so many great players that struggled their second year but we don't have time to go into the excessive numbers that fall into that category. Having said that, since he competed against older players in his rookie year, let's look at their sophomore year totals for a total combined total and included is Nail's draft year comrades. This would mean no matter the age, all those players who have entered the NHL along with Nail, we are comparing their PPG. With the exception of a small sample of Tomas Hertl, taking a look at these totals, I think we all can agree that while Nail started this season with some difficulties he is not that far off from other players struggles as well when we look at the bigger picture here. I think it is also fair to say that his offence has sacrificed some at the expense of learning a better defensive game. All in all I believe that Nail's trade value is not down but in fact just about to start turning in a upward arrow. The player I listed in August at #11. Ivan is a Hard-nosed forward from Moscow, Russia, the 6-foot-3, 185-pound playing left wing . 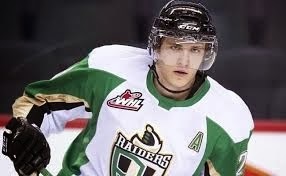 "The biggest part of his game is that he competes hard," NHL Central Scouting's Troy Dumville told NHL.com. "Last year he played wing and later made the adjustment to center, so he's a pretty adaptable kid with good hockey sense. He does a lot of the little things. His defensive-zone coverage was really impressive." 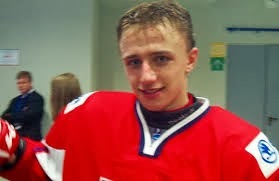 As a rookie Barbashev had 18 goals, 62 points and a plus-9 rating in 68 games. Ivan has become more physically involved in the play as he matures which at his size is a bonus to NHL clubs. It is very likely he will fill out more in muscle the next couple years with his 6'3 frame. He is definitely one of the most skilled guys in his league. He won't be playing that physical game night in and night out, but at the same time he's capable of it. 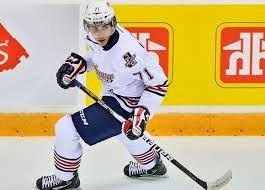 If the Oilers could secure a additional first round draft pick this year in the top 15, he could be a possible target with good size, skill and potential who came to the CHL to play the NHL type game. The player I listed in August at #10. Jakub Vrana moved to Sweden two years ago to continue his development He has made his way up to Sweden's top professional flight as a 17-year-old. With lots of speed to burn and a complete two-way player he can be a dynamic player. Jakub can tend to try to go it alone through defenders when he should be passing it off sometimes but likely competition against men now with help with that part of his development. Jakub is probably still at least 2 years away from making any kind of impact in North America. He is capable of playing either wing, Vrana has had some struggles finding icetime with Linkoping since his promotion but that was too be expected in this big jump in competition. Jacub will be falling out of the top 15 ranking in the season ending rankings I put out. Between his drastic drop in production at a higher level and other players rosining in their game it is very difficult to lee him in the top 15. Very unlikely the Oilers would even consider Jacob as he is a average size player, winger and doesn't play a strong enough team game. The player I listed in August at #9. Dal Colle played for the gold medal-winning Team Canada U18 team in the 2013 before returning to Oshawa for his second OHL season. Playing like a a bull in a china shop he uses his natural talents well. Scouts say he has a imposing frame and already shows great balance and strength on his skates. While 6'2 in height, his weight would be a concern for me to play at the next level and be imposing still. He does play a strong two-way game, battles hard and shows soft hands around the net. Many consider Michael to have High-end offensive tools to go with a great drive. Some have said he plays a style like Ryan Getzlaf but IMO it is more style then skill. Dal Colle likes to be creating his chances off the cycle and use his taller frame to an advantage. Getting to open spots on the ice well, he also utilizes coming off the wall and driving to the net with aggression. If he adds more size and strength to his frame, he's going to become a force. Michael tells a writer "I'm always looking to get faster, quicker," he said. "That was my weakness growing up. I was always a little bit sluggish. I still need to get bigger. I'm only 180 pounds, so if I want to be a successful at the next level I need to put on some muscle mass." Michael is a left hander center and is considered a top 5-6 player for sure. If the Oilers were to select him he is more of a 2 year project likely. 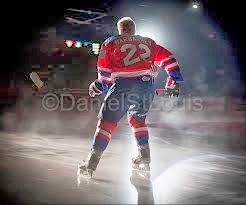 Another year in jr hockey followed by 1 season in the AHL should be just what the dr ordered. It's unlikely he is selected in a Top 3 pick and that is where they are sitting to pick at worst if a lower ranked team were to win the lottery draft in 2014. Good player but would fall in the second group of good players in this June's draft. The player I listed in August at #8. Leon will be rising quite considerably from the #8 spot but definitely not into the top 2 player ranking for my ranking for the 2014 NHL Entry Draft. Drasatl is a good player but is IMO a different class outside of Reinhart and Ekblad. ISS hockey says "Off the charts vision and smarts combined with a power frame. Leading the way in PA". Craig Button says "Leon is a blend of skill and power and comfortable in either element. His skill derives from excellent hockey sense and the ability to make plays and recognize what is unfolding. His power is more along the lines of being hard to deter and imposing himself on opponents, with a serious determination to make a difference. Skating is good with much room to improve. A Top 2 line type forward." While back in August before the season began Future Considerations stated "Draisaitl is a playmaking center who isn't overly physical but uses his size effectively to shield himself and the puck. He has excellent vision and knows where his options are. He has soft hands and a steady stride, but his smarts are his most important asset." I have not followed Leon much until the last 2 months and while he shows lots of promise the question I have is, can he still display that kind of ability when competing against bigger, stronger and more skilled players consistently. His lack of discipline at the U20 world jrs and his inability to shine at the Prospects game send off a couple caution signs. I still see this player good, just not as a elite player in the NHL. Seeing as time goes by the Oilers seemed destined for a top 2 pick, it's highly unlikely he will be selected by the Oil. That is, unless a team other then Buffalo or Edmonton win the lottery and they end up selecting 3rd overall. At third overall, he may be a player the Oilers consider.